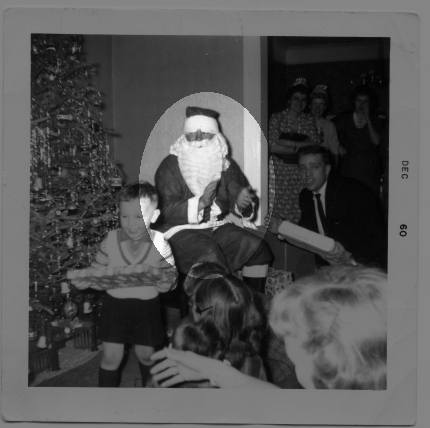 Poor Mojo's Classic Rant: Terrence_McWee "The Terrors of Santa Claus (A Photo-Essay)(a Poor Mojo's Xmas Classic)"
[This images was found mixed in among an unsorted lot bought at auction. The lot consisted of more than 1,000 black and white photographs, of a variety of methods and styles, dating from the late 1800s through the early 1980s. All photographs apparently originated in the United States or Europe; none had a clear provenance. An average of ten cents was paid for each image. We are fortunate to have the photo lab's mark (along the right edge) indicating this print was made in December of 1960. Based upon the obvious iconographic content of the photographer, we are lead to believe that it was printed soon after being shot. 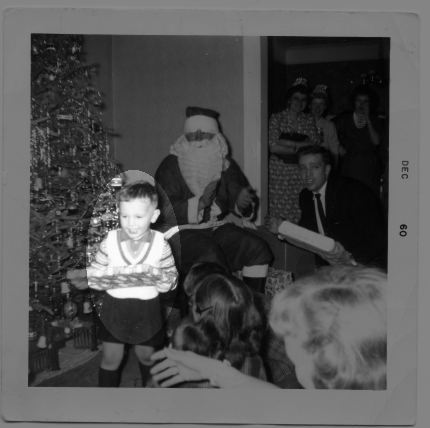 The reverse of the photograph, where so many amateur photographers make invaluable notes, simply reads "Santa h," written across the upper left. What the h might signify remains to be determined. There are three principals worthy of consideration, which have been termed: The Fleeing Boy, The Uncertain Man (casually referred to as the "Strung" Man) and Santa. Face frozen in a rictus of antic glee or fear? The boy darts off from Santa, his as-of-yet unknown reward clutched in hand. Drawn taught between what he has done and what he should do (hence the "strung"); is it the Strung Man's responsibility to shield and protect the boy, or to let roll forward the Santa he has conjured to this occasion? In his tepid uncertainty, the Strung Man evokes the Ivan Albright painting "That Which I Should Have Done I Did Not Do" (1931-41, currently held in the Art Institute of Chicago's permanent collection.) If only Mr. Albright had seen this snap-shot, had looked deep into the helpless, tipping eyes of the Strung Man; he'd have had no need to touch brush to canvas, if he could simply have framed the photo we hold here now. Hands apart, caught mid-clap in appreciation of the boy's puckishness, or prepared to leap? If there is a principal among these principals, it is he: the First Cause of the Season. Look at his eyes. See what you see. We realized that it would be impossible to even begin to discuss this item and its interest without a brief discussion of the principal subject, Santa Claus. But, as we began to prepare this overview, it quickly became apparent that the subject of Santa Clause swiftly seeped out to entirely take over the endeavor, much as Christianity itself (of which he is the avante garde avatar, it cannot be denied) had and does continue to seep and take over every pagan myth, saturnalian celebration and quaint local tradition it touches. It's quite clear that, behind the jolly jingle, the child (and these songs always have children as their primary audience) is being threatened, and specifically told that although there are a great man injustices worthy of pouting or crying about, you had best not do so; it is better not to have emotions. And why? "It is like when I was a girl," Amela confided in us, tearfully, "in Bosnia. The men, the soldiers, had come into our home and raped our mother. Sister and I hid below the kitchen sink. I was small, and had begun to cry, and she whispered to me Do not cry! Do not cry! If the men hear, they will do to us the same! And so my mother was raped and killed, and I did not cry. I see those boots, the false patent-leather boots the santas at the shopping mall wear, and I hear the boots of those men clomping across our kitchen floor. But we did not cry, and they did not find us." 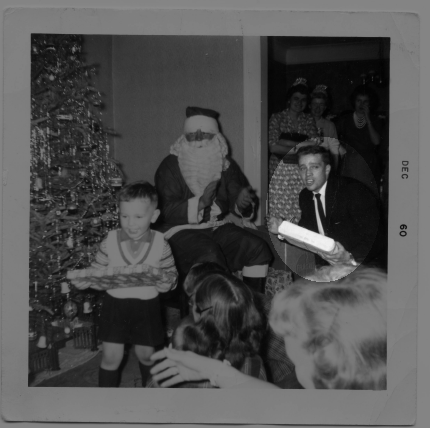 We quickly discovered, even among our own small research group, that the early childhood fear of Santa Claus was universal. 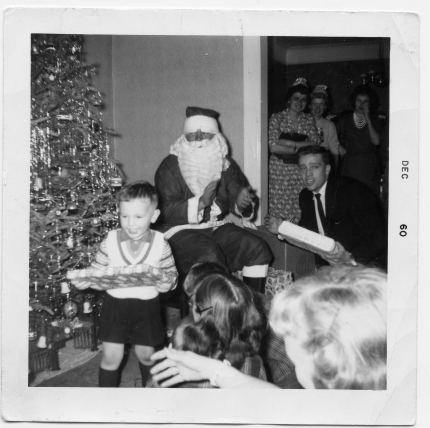 Although we each lacked the memory of fearing that jolly character— having been too young to possibly recall the everyday trauma of the moment— we each nonetheless had stories passed to us from out parents of our fear of santas. Those of us with children, similarly, have the same anecdotes of our own young. And why, to a child still unschooled in hiding his fear, his true heart, from himself, would Santa not induce terror? He is a transgressive figure: even in periods when long hair and beards or actively frowned upon (the 1960s and 70s in the United States, for example), he is universally depicted as having the hair and beard only commonly seen on social outcasts (e.g. street people, insane criminals like Charles Manson and Ted Kaczynski, hippies) and religious extremists (e.g. Chassidic Jews, Amish men, Radical Islamists)— who are, themselves, a self-outcast social subset. Similarly, his clothing is strange and outmoded (not unlike those street persons, clerics and rabbis.) His face is concealed. He is loud when being loud is disapproved of. He invites children to take his candy and sit upon his lap, when such invitations are told to be highly suspect. He boldly asks for money in the streets. Our modern image of Santa Claus finds its basis in the same place as our western notion of clowns: the old Norse berserkers; warriors who, maddened with drink and a slurry of hallucinogenic fly agaric Amanita muscaria mushrooms— which rendered them impervious to pain, cold and fear— would charge into battle wearing nothing but the bloody, inside-out skins of bears, to tear their enemies literally limb from limb, in ecstatic ignorance of any social norms or rules of engagement. But, where-as the clown has become a distant, terrifying relation to his berserker past, Santa Claus has, after a time, come back around to being nearly one in the same. Look at Santa's suit: the smooth red fabric, turned up white fur at the cuffs. The conclusions are obvious. As they reach early school age, it is natural for children to begin to lie a great deal. In this stage of their development, they have recently come to realize that an adult knows many things, but does not have special access to all facts or the interior of their minds; the child has discovered the possibility of lying, and thus relishes it. This is the origin of all art. And, at this same time, they are struck with the image of this Yearly Transgressor, who comes, alone, into your home uninvited, and who sees into your heart and mind, and to whom you must pay fealty by leaving food, but who cannot be bribed or dissuaded. This is a new and terrible God, shown to them just as they are starting to suspect in the veracity of the Sunday School God they observe for 11 months of the year. This is not a 3300 year-old desert spirit, not an emaciated man undead on the cross for 2000 years, not an absentee God unheard from since he whispered from a burning bush or guided Mohammed's pen. This walker comes yearly. This god is emphatically fleshy and corporeal. He sees, he judges, he decides, he serves out punishment or reward. This is a non-denominational God, a Western Cultural God, as a-foot in the lives of American, European and Japanese Jews, Muslims, Hindus and Buddhists as he is Christians. This is not quite Jesus— deathless, who forgives and loves all— nor the Faceless God of the Old Testament, who behaves erratically, and holds dear only His select People. S A N T A = S A T A . . .
— but no; too obvious. Still, is there not a character of temptation to Santa? Does he not draw us into the cardinal sins of greed, materialistic envy, the sloth of vacation, the vanity of the fine new things we receive, the gluttony of holiday meals, the licensed lust of mistletoe. And wrath? Well, he himself is Wrath; that image he was misprint from— the insane, blood-drink-&-hallucinogen-raged berserker charging out across the snow to cut through his enemy like an axe incarnate, no longer a simple man, no longer bound by the laws of men or of physics or of God or the Devil— that is Wrath distilled into Man. Is he not the Transgressor, the Temptor, the Advocate, the Adversary— a trap meant to lead us to temptation? He makes a list, he checks it twice; he is Judge, Jury and Executioner. Now, permit us a brief detour into Judaic folklore, and discuss the golem. The golem is one of the few monsters recognized in Jewish superstition. He is a sort of elemental creature, evoked from mud or sticks or garbage, and meant to serve a specific sorcerer for a specific purpose. At his invocation, EMET is written upon his hand— Truth in Hebrew, three letters: Aleph, Mem, Tet— and to cast him back the initial Aleph— a silent place-holding letter— is erased, changing EMET (Truth) into MET (Death.) The classic golem story has a well-intentioned sorcerer making a golem, only to have it run amok (either after the sorcerer's death, or owing to a poorly thought through wording at the conjuring or in some instructions.) This is the early analog of the "Robot Run Amok" speculative stories we have to this day, and has largely been replaced by "Frankenstein" tales. The notion of a golem is apt: is not Santa Claus an servant yearly evoked, for purposes equal parts sinister and well-meaning, by parents across the globe? Do well, or Santa shall not come— or he will come, and he will hurt you. In trying to bring joy, as instructed, he largely brings fear, then simple trepidation, and finally blinkered-suspicion. He is a golem made of the detritus of old, dead, outmoded gods: Pan, Bacchus, Satan, Ganeesh, Kali, Jesus, Baal, the Unpronounceable God of the Hebrews— and while intended to serve in some limited capacity to bring joy to children and warn those who would act ill, he has run amok (who has not complained of the "commercialization of Christmas"? ), and drives forward and cultivates the very values of greed and ill-will that he was brought forth with the intention of quelling. But this notion is incomplete; the darkness he brings is beyond fear and surveillance and suspicion, beyond greed and lust and enmity. See him, in his bloody skins, out in the night, scrabbling across roofs and down streets like the embodiment of outrageous fortune itself. We don't even have a name, anymore, for this thing that Santa is. The Peregrine. The Homeless Traveller. The Wanderer. The Terrible Walker Alone. [They] realized that the demon, the terrible walker alone, was going to descend on their hall, that he had plotted all day, from dawn-light until darkness gathered again over the world and stealthy night-shapes came stealing forth under the cloud-murk. Then out of the night came the shadow-stalker, stealthy and swift . . . in off the moors, down through the mist bands, God-cursed Grendel came greedily loping, the bane of the race of men . . . hunting for prey in the high hall. [H]is rage boiled over, he ripped open the mouth of the building, maddening for blood, pacing the length of the patterned floor with his loathsome tread, while a baleful light, flame more than light, flared from his eyes. He saw many men in the mansion, sleeping . . . before morning he would rip life from limb and devour them, feed on their flesh . . .
Dear boy, you are very right to flee: Santa Claus is coming to Town. Happy Holidays from the Carter Compound!